This outfit was one of those rare combinations that I wasn’t entirely happy with when when I left the house, but when we were shooting the pictures I was pleasantly surprised. I hadn’t realised that I’d picked out the magenta colour in the scarf with the bag, nor that the boots actually looked okay with tights and a skirt. (I’d only worn them with trousers till that point, but I was running late for my hair appointment and had zero time to change.) The overall colour combination was really lovely – maybe I’m better at this than I thought! I nearly came a cropper with the wind and that floaty pleated skirt – I was having a serious battle with the wind. I had to hold my hair (freshly out of the hairdressers) out of my face with one hand, and hold down my skirt with the other. The wind does make for some great movement in pictures, but gawwwwd does it take a lot of shots to get it right. The weather is crazy wet and windy in the UK at the moment, I hope you’re all safe from the various elements wherever in the world you are. Are you looking forward to a change in your weather and wearing something different? I’m dreaming of floaty summer dresses right now…! 1. 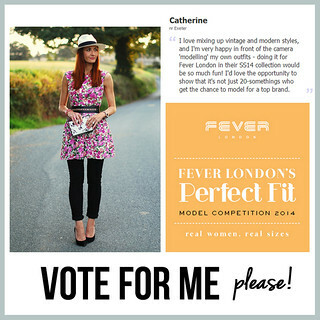 PLEASE PLEASE PLEASE VOTE FOR ME to win the chance to model the Fever London SS14 collection! I’d love to win and show everyone that it’s not just 20-somethings that get the chance to do this! Go to this link (on Facebook): http://bit.ly/1eh8BCt – simply Like their page and click ‘Vote’ – that’s it. 2. 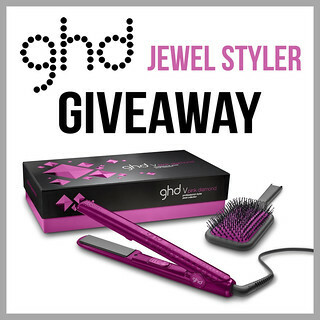 DON’T FORGET TO ENTER my fabulous Giveaway for a ghd Diamond Pink Hair Styler worth £135 – it’s open internationally! Such a lovely outfit, that skirt is beautiful! Thanks for joining the Friday's Fab Favorites link up, I was a co-host last week and I'm trying to read every post! I adore this outfit! The colors pop so great against the leather jacket. love, love, love it! very pretty! Your hair is gorgeous! Don't you love those serendipitous moments when you rushed something together only to find out that it worked in ways you never imagined? Well done with the bag and scarf combo! They look great with the blue from the skirt! I want those booties!! They never work for me my ankles are so small. And cobalt blue is my color. 🙂 You look fab!! Love your outfit – it's so bold, yet chic! The blue of the skirt …..oh my.. I refuse to believe you are a '40-something' blogger. Your skin is better than mine and I'm in my 20's. You look lovely and the scarf is beautiful. Thanks for getting me started. I think your hair is quite lovely in this pic, and you are very colorful which I am sure brightens the mood! I did vote for you last night. beautiful look! we vote again and again!! !hope u win! The blue skirt is absolutely gorgeous! A look absolutely gorgeous. I love the pleated skirt, with this pretty blue klein, and I also love the combination of the bag and scarf, both wonderful. Hello there in the wet and windy U.K….Ciao,beautiful photos and your outfit is a work of Art…lovely combo of colours & great style …you're an Artist of Style! Whats not to love about this outfit? Everything just works. I can't wait for summer to be over here in Australia. Lovely look Catherine. Beautiful and inspiring outfit. Now I know what to do with a similar vintage skirt I bought recently:) The black and cobalt are such a stunning combination and the addition of pink add the 'pretty'. I also enjoy the contast of tough with the leather jacket with the feminine of the skirt. It's quite nice when you realise an outfit look better than you first thought. You look great. Gosh yes, you've got the opposite problem in Australia haven't you! My sister lives in Oz and she said it's ridiculously hot. I like the heat, but I'm sure even I would get sick of it after a while! I love the scarf! I always think coloured scarves need to be worn when we wear black which drains skin colour. Love your bright skirt too! The pink bag with the blue skirt is fabulous! 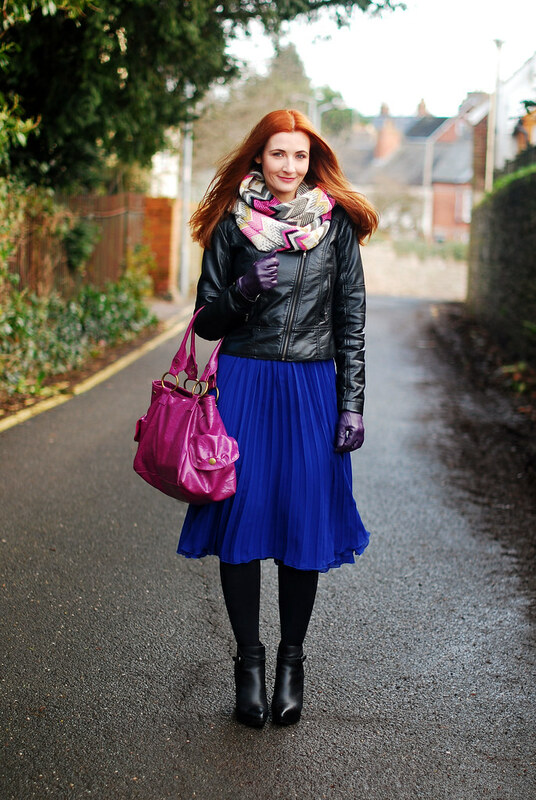 Cor – love your outfit again – the skirt is so nice, and how good do the bag and scarf look !! Thank you Paul, my lovely! You look lovely. I love the bright colors with the black. I really want to be able to wear a pleated skirt, but they just don't work with my body type. It makes me sad, so I will admire you. Oh bless you, sweetie! I'm sure there are things that don't look great on me that you look fabulous in, though…! I love this!! Magenta looks fantastic with royal blue…and the black totally makes everything else pop! You certainly ARE great at this, Catherine…your colour combination here just explodes off my iPad screen (in the best possible way, of course!!) Your scarf does a fab job of tying the whole palette together; and booties with a skirt or dress?? One of my personal go-to looks right now!! I love the pop of the cobalt with the bright pink! You wear bright colors so well. This is beautiful, color done with a keen eye! I'm doing a similar type of styling in my next post. Taking the basics and amping up the color translates to followers of all ages. These colors compliment your hair perfectly. I love the lightweight fabric of the skirt and the magenta bag is right on. Thanks Ann – as I said I didn't think about the colours too much, sometimes it's just a happy accident! 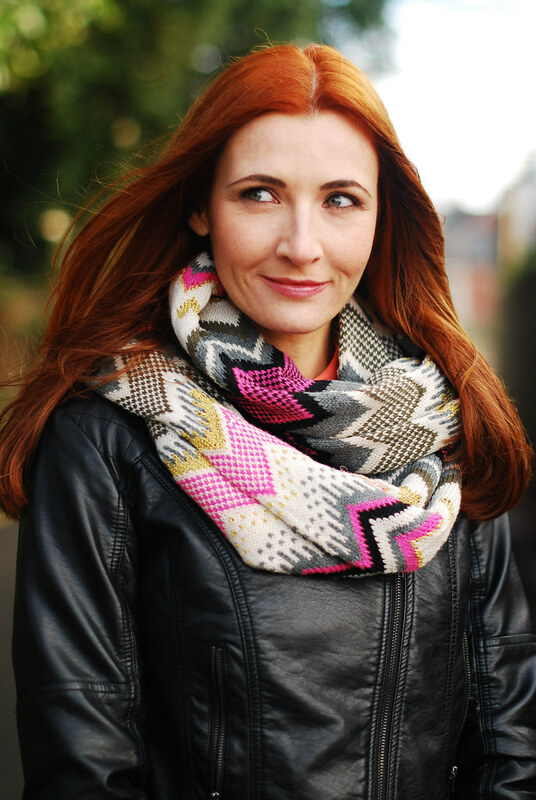 I definitely love the scarf– it really is the center of the look. Isn't it interesting how looks can surprise us? I love it, because it pushes me out of my comfort zone! Gorgoues chosen colors! What a nice color-flash, including the great color of your hair! Thank you Dana – my hairdresser will be pleased…!